April 8th, 2019 - Posted in New York Apartment Market. Anyone who has ever fallen in love with New York City understands the allure of the city’s fast-paced energy, awe-inspiring skyscrapers, world-famous sightseeing, trendy shopping, and unique dining. NYC’s spirit is so unparalleled by any other city that the best way to truly experience it is by fully embracing the lifestyle. For this reason, a vacation rental in an authentic NYC apartment is the ideal way to experience the city for anyone who loves New York. You can search for your ideal vacation rental by browsing our website, but why not start with our top-rated vacation rental apartments, as determined by travelers like you? See what features others have loved about living like a local in a furnished vacation apartment to determine what you should seek in your own search. If you want to make NYC your home for a month or longer, check out our top-rated furnished apartment sublets to start your search for a home away from home! It’s no secret that it’s expensive to live in New York City, particularly in Manhattan. Vacation rentals can often be an appealing option for those enamored with the Big Apple because of the rare opportunity they present to live independently in a prime NYC location. 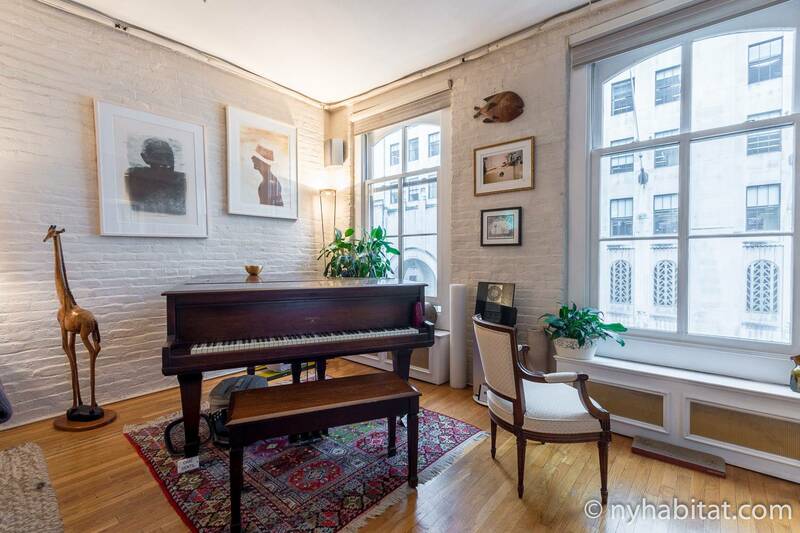 Nowhere is this truer than in this sophisticated 1-bedroom vacation rental apartment in Gramercy! If you’re unfamiliar, Gramercy is a historic district and neighborhood in downtown Manhattan near the Flatiron Building. 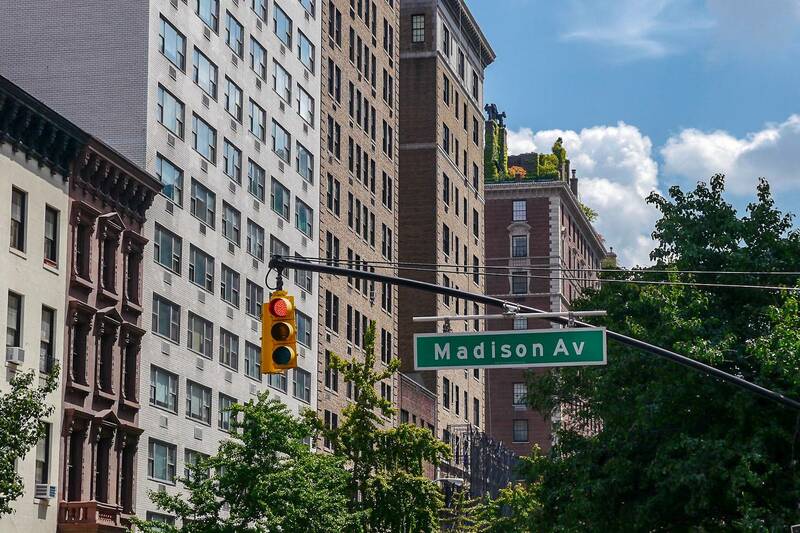 The neighborhood itself is centered around Gramercy Park, a super-exclusive gated park to which only select Gramercy residents have a key to enter. Maybe it’s the exclusive location that’s so loved about this top-rated vacation rental, maybe it’s the location in a converted loft warehouse building with elevator, maybe it’s the comfortable amenities like a dishwasher, laundry, and a king-sized bed, or maybe it’s the fine, curated furnishings that give this space its New York character! If you want a vacation rental with decorative panache, a welcoming host, an exclusive Manhattan address, and a homey, lived-in feel, don’t miss this top-rated Gramercy vacation rental. Another wonderful benefit of a vacation rental, particularly in a city with limited space like New York, is that you get more space for your dollar, which is a welcome alternative for families who don’t wish to squeeze into a hotel room. 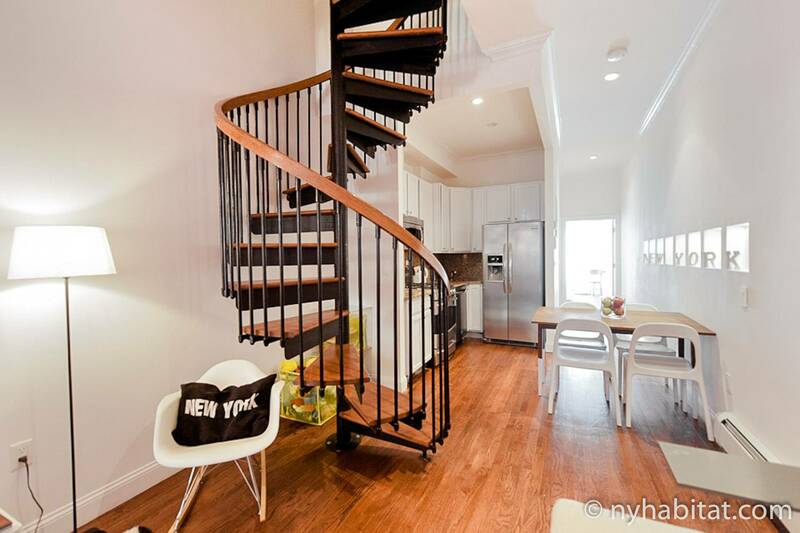 One such rental where these benefits are truly on display is in this 2-bedroom duplex vacation rental in Harlem! If you’re planning a family trip to New York City, this space is really worth considering. The apartment comfortably accommodates a family of four with thoughtful features like a sectional sofa, a four-person dining table for family dinners, and separate sleeping areas. Adventurous kids will absolutely love climbing the whimsical spiral staircase to reach a bedroom with single-sized bunk beds. There’s even a private backyard space where the whole family can hang out and kids can play safely. 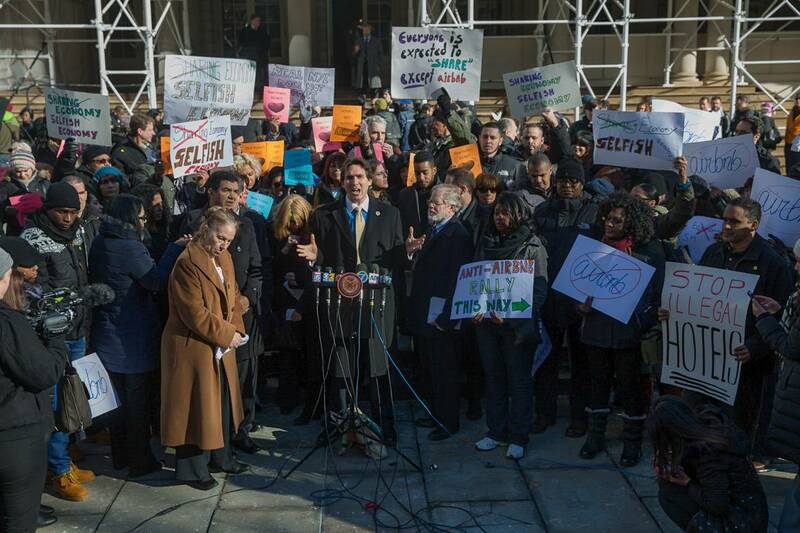 Go ahead and bring the whole family to New York City! 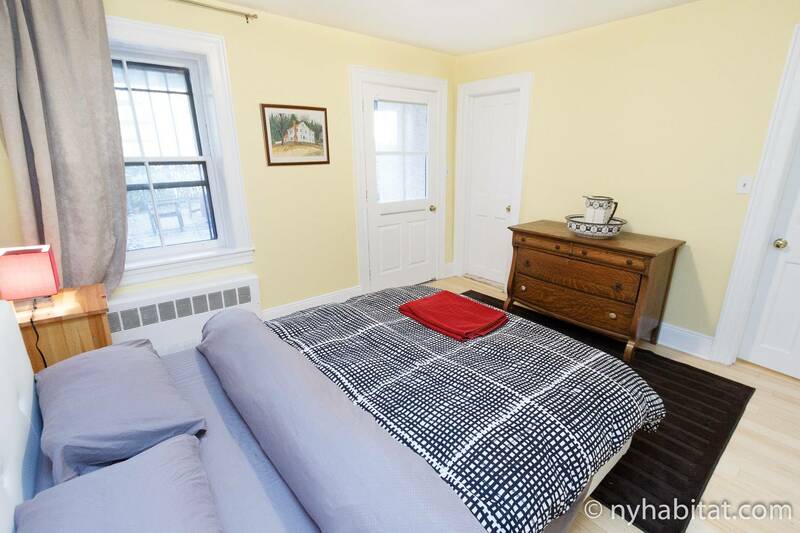 With flexible accommodations like this top-rated Harlem vacation rental, everyone can rest comfortably and enjoy their personal space. 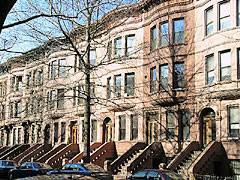 The vibrant neighborhood of Harlem is also one of the most budget-friendly places to stay in Manhattan, meaning that you can have the best of both worlds: rich experiences and a great price! 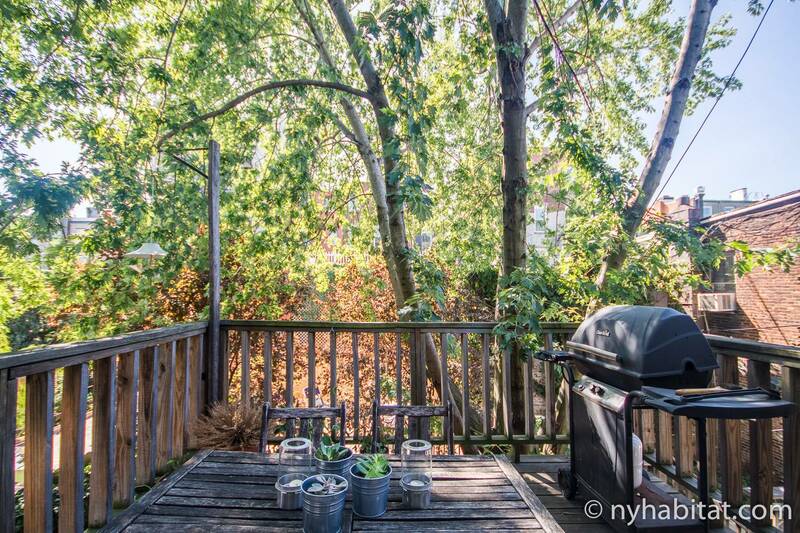 Nowhere is that balance better embodied than in this 2-bedroom vacation rental. 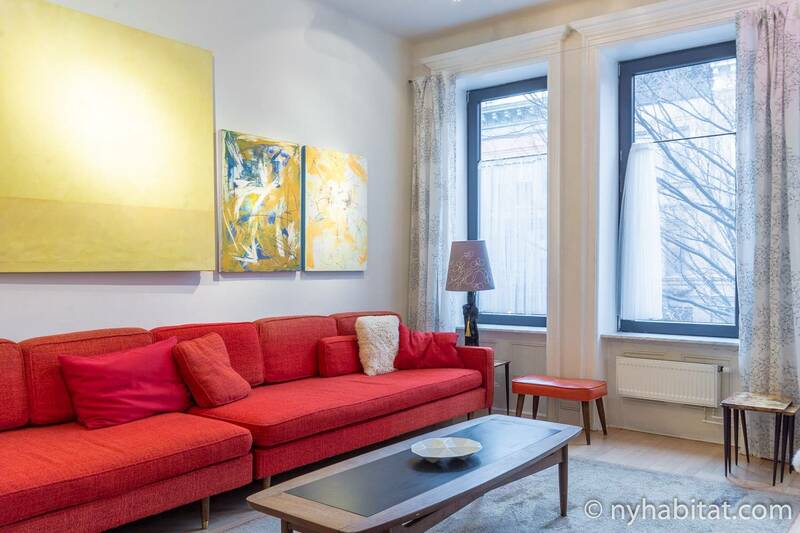 If you come to New York for the world-class cultural institutions like the Metropolitan Museum of Art, the Apollo Theater or the Guggenheim Museum, you’ll love this rental. It’s decorated in an artistic contemporary style that mirrors the sophisticated nature of NYC, and as an added bonus, its location puts you close to all those attractions and more! Travelers might want to check out this Harlem rental if they’re looking for the flexibility, additional space, and style that are hard to find in a traditional hotel, as well as a warm welcome from a friendly host! New York Habitat is dedicated to serving first-time visitors and New York travel veterans alike, and we’re proud to offer apartments all across the five boroughs of New York City. 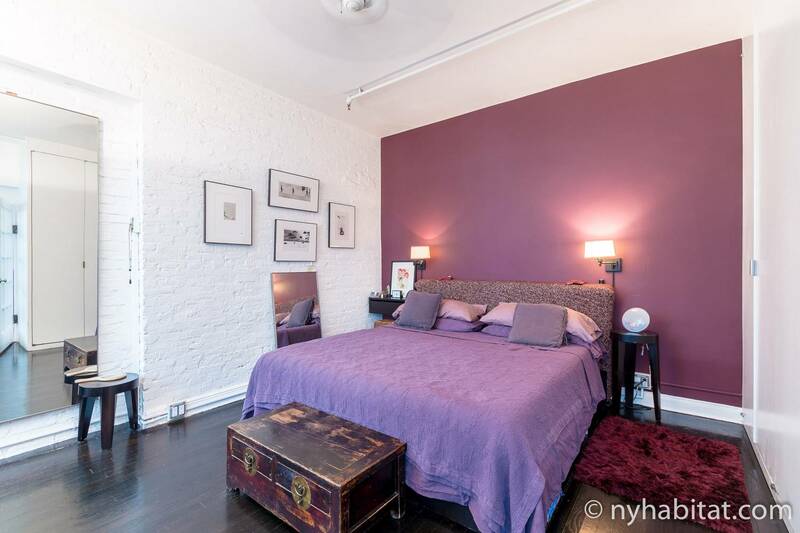 Just across the East River from Manhattan is this 5-star-rated 2-bedroom Williamsburg vacation rental that we highly recommend to return visitors to New York! The apartment is located in a turn-of-the-century townhouse that comes furnished with all the essentials and offers space that’s atypical of the more cramped apartments in Manhattan. Williamsburg has been reputed as a trendsetting neighborhood for the past 2 decades, and the whimsical, rustic décor of this rental fits right in with the neighborhood’s vibe. Travelers seeking more independence will love the full contemporary kitchen in this rental that allows them to cook their own meals. 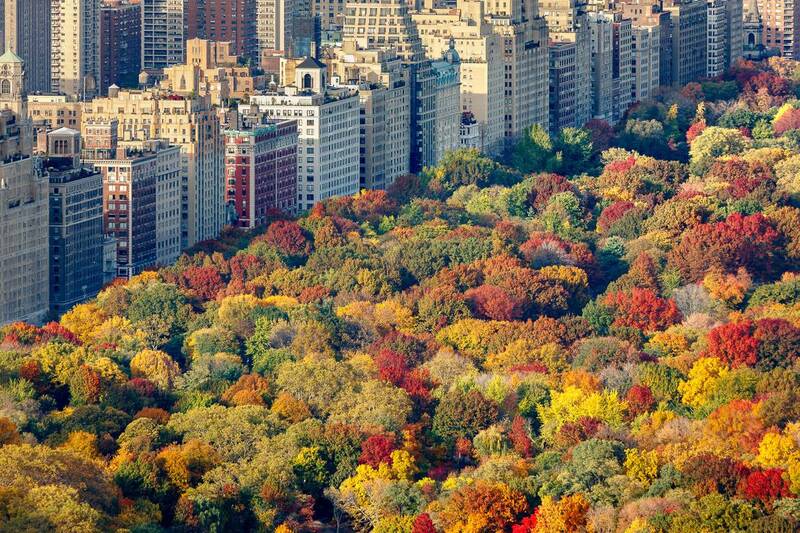 Summer vacations to New York will also receive a boost in this apartment! The rental features air conditioning and a spacious backyard area with a patio and a barbecue right off the kitchen, perfect for grilling out. Our guess is that if you’re looking to forge your own path, you’ll also love a list of alternate attractions you may not have explored before. 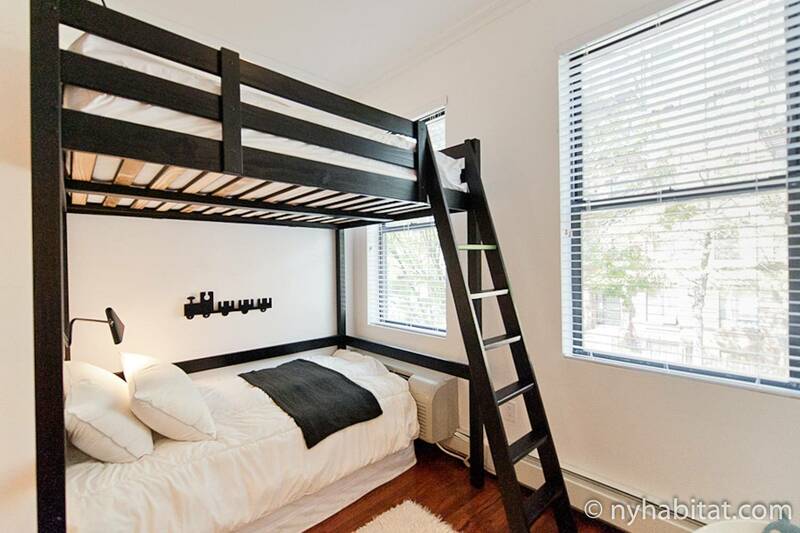 If you fall in love with Williamsburg, you can also book this apartment rental as a monthly furnished sublet. 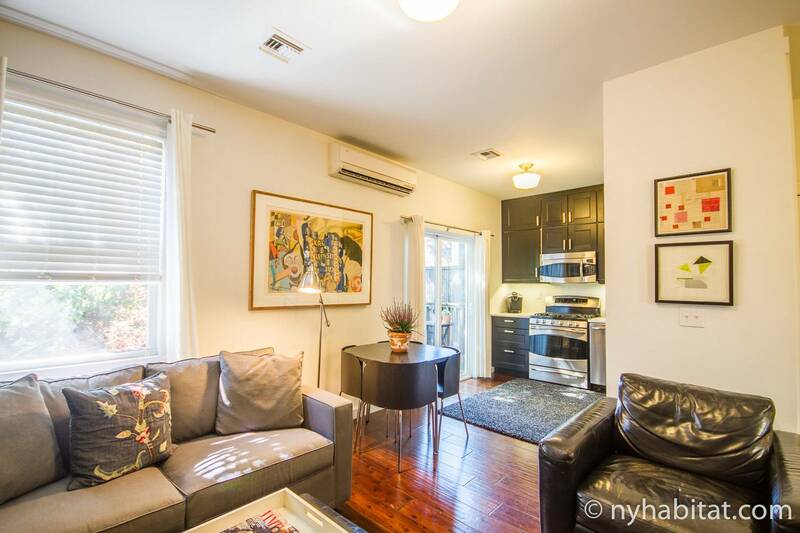 Check out this two-bedroom to escape the chaos of Midtown for a vacation rental that lets you explore the city like a local and still provides the comfortable furnishings of home. Of course, one of the biggest benefits to renting a vacation rental apartment with New York Habitat is the extra level of personalization that comes with the territory. Vacation rentals are managed by owners who will usually meet you upon check-in and be available for any questions throughout the rental process. Our owners are often praised as much as the apartments themselves, such as Nick, the owner of this top-rated 1-bedroom vacation rental in Boerum Hill, Brooklyn! 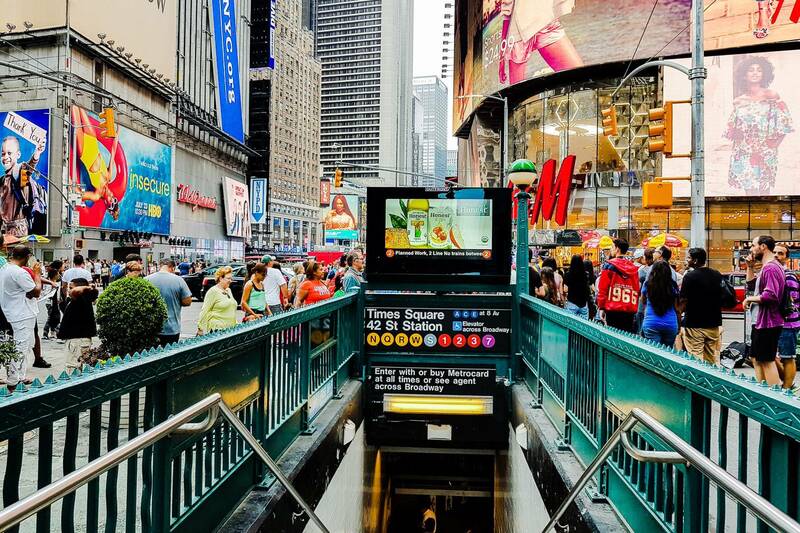 Having the knowledge of a local can be invaluable to make the most of your trip, whether it’s your first or fiftieth time in New York. That’s why it’s also great to rent with New York Habitat. We can put you in touch with a licensed real estate agent who will help you find the perfect apartment for you. 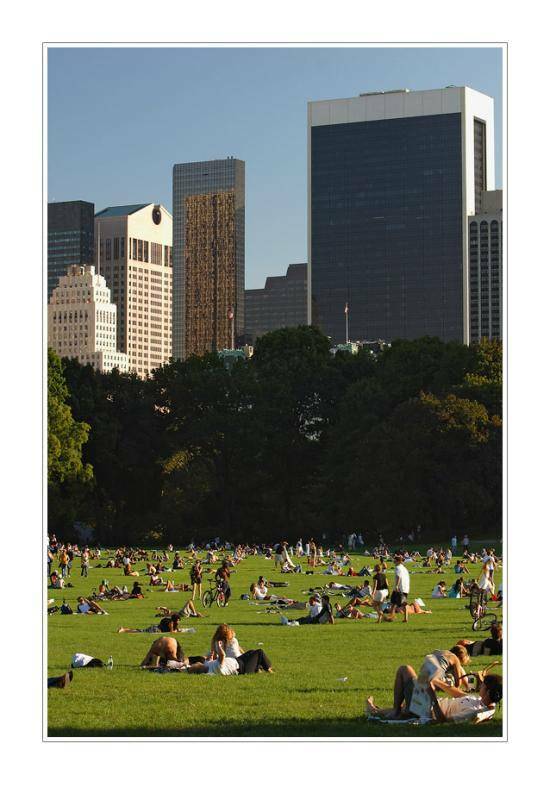 Our unique approach has taken us through 30 years in the New York real estate market and left thousands of clients satisfied. We hope this list has left you with some new ideas about where to stay on your next trip to New York. Whether you choose one of our top-rated vacation rentals or rent something entirely new, our agents are here to help. Which of these top-rated vacation rentals is your favorite? Let us know in the comments!